I’m frantically trying to get everything ready for this school year. I officially start on Monday and the kids come Wednesday. I have so much more to do and my room is nowhere near ready! I’ve been trying to juggle everything for the last few weeks and have been failing miserably. I had a couple posts I wanted to do this week but I just didn’t have time to get to them. I haven’t had time to do much of anything and I feel a little frantic. I can’t wait till things are underway though! When I saw this idea for a linky from Christina from Bunting, Books, and Bainbridge, I knew I wanted to participate. It’s such a fun way to showcase some of the items I’ve made. Click on any of the pictures to go check out the item. 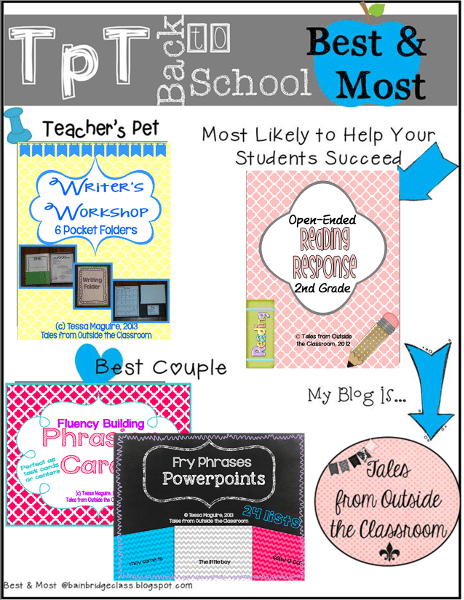 -My Teacher’s Pet item is the one that every teacher needs. It’s my Writer’s Workshop Folders set. Inside I include graphic organizers, labels, and other accents to make this 6-pocket folder set. -My Most Likely to Help Students Succeed is my popular Open Ended Reading Response set for 2nd grade. Students read and answer questions about the text in complete sentences. It was a crucial item for me last year in working with my 2nd and 3rd grade students. -The Best Couple is my Fluency Building Phrasing Cards and Fry Phrase Powerpoints. I’ll be using both in my classroom to help build my students fluency. I’m sure you’ve heard by now that TeachersPayTeachers is doing their Back to School Sale starting tomorrow! My entire store is 20% off. Plus, if you use the code BTS13 you can get an additional 10% off (for a total of 28%). Click the image below to head to my store and check out everything I have to offer. I hope to be back soon-with a real post- showing off my room. If I can just get the stinking thing finished. I just wishlisted your 2nd grade passages. They look great!